In trying to be a better worker, and not be under the watchful eye of Big Brother, I am now trying to reserve my posting for home. The problem with this is once at home, I have a tendency to get distracted by regular things (dinner, baby, cleaning, and crafting) and never manage to get around to it. Now I am making a point of it, since I signed up for NoBloPoMo. This is going to be a trip. 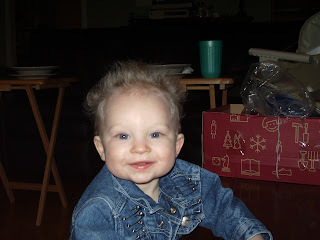 Here's Billy Idol, who decided to make an appearance at our house for Halloween. Isn't he just adorable?! I'm working on a secret project, and since I think the gift recipient will be watching this blog for a time (due to pictures of Billy being posted) I'll just let you have a secret update...it's going well. :0) I'll post pictures after Christmas of them, but they'll be on Ravelry.